I have been using these balls for many years and they are great. You really get a sense for how you are hitting the ball as far as trajectory, spin, and with a little imagination, distance. I have a backyard that is about 110 yards from my tee off area to the tree line and this allows me to pretty much swing away with any club and keep the ball in play as long as there's no wind at my back. The balls do eventually wear but they keep their characteristics (losing a little distance over time) for many hits. 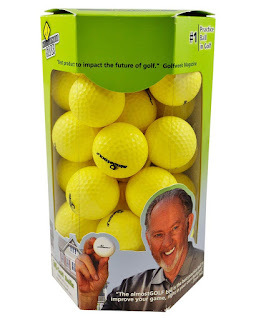 They have really helped my game because it's so much easier (and cheaper) to go out and hit a few in the backyard in the evening rather than going to the driving range so I tend to do it way more often than I would otherwise.